I am a photographer and writer in beautiful Southern California. I love to share stories. I like to explore places where few people venture. I don't like to make iconic images of iconic locations. about Jeeps and the off road lifestyle. Read my stories about my adventures on my blog and on the automotive enthusiast publication DrivingLine. 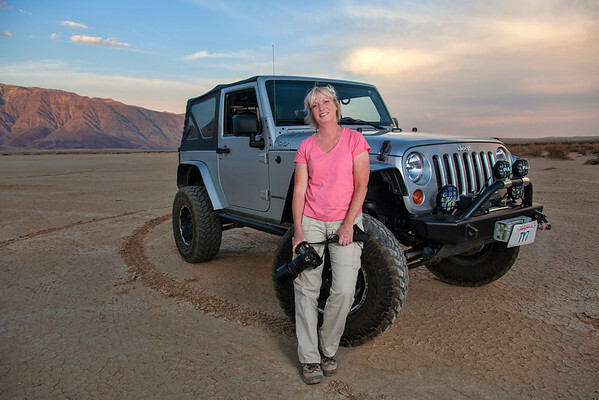 I started my photography career as an automotive photographer in the gray market. I later earned an MBA and worked as an executive in the automotive industry for several years. I returned to my passions of photography and the outdoors when I moved to California and fell in love with the land. My work has been used in books, advertisements, corporate publications and image libraries, and has been published in the NY Times, Orange County Register and newspapers across the globe. My art is collected by enthusiasts around the world. I did the California-based still photography for the Baseball Hall of Fame Critic's Choice award-winning movie The Emerald Diamond. People liked my stories and began asking me to write articles to accompany my photos. In 2013 I became a regular contributor to Nitto Tire's digital and print automotive enthusiast lifestyle publication DrivingLine, and I wrote several articles for C.O.R.V.A. 's Off Roaders in Action. I also wrote and photographed the section on Picacho State Recreational Area for Photographing California, Vol 2 published by Graphie International, Inc. I have recently started dabbling in juried art exhibitions. My work received an Honorable Mention from curator Jody Miller at the L. A. Photo Curator : What Remains exhibition, and was selected by juror Jane Fulton Alt for exhibition at Photo Place Gallery A Sense of Place exhibition, where it was also used as the title page image in the exhibition catalog. I volunteer my services as a photographer to 4 Wheel 2 Heal, a 501(c)3 organization that takes disabled vets out on the trail for some fun wheeling and camping. Still have questions or want to talk about working together? Send me an e-mail using the Contact Link on the left or give me a call at 949.444.8190. I'd love to hear from you!